PRINCIPAL CONTENTSFOLLOWING THE ALLEN IN DORSETby DESMOND HAWKINS INTERNATIONAL ATHLETICS AT CRYSTAL PALACEby NEIL ALLEN .. .. EXOTICS ON A KENTISH BEACHby ALLEN PATERSON— FELL HOUNDS: THE RYDAL SHOWby J. N. P. WATSON.. .. VILLAS ON THE VECHT —IIby JOHN CORNFORTH and HERBERT JAN HIJMERSMA .WORLD HORSE TRIALS PREVIEW ..by ELIZABETH JOHNSON SUMMER SONG ON THE SOMERSET LEVELSby ROBIN WILLIAMS— .. HEATHERLEY'S ART SCHOOL—IIby CHRISTOPHER NEVE . JAPANESE PRINTS AT THE BRITISHMUSEUMby FRANK DAVIS.. PARTRIDGE PROSPECTSby C. L. COLES— SOANE'S GRATITUDE IN. STONEby MARGARET HUDSON ELIZABETH I IN EAST ANGLAby BRYAN BEVAN .. Regular FeaturesA COUNTRYMAN'S NOTESby IAN NIALL .. . . TALKING ABOUT SALEROOMSby FRANK DAVIS • . THE MUSICAL SCENE by KENNETH LOVELAND TOWN AND COUNTRY.. A GOLF COMMENTARYby PAT WARD-THOMAS . . CORRESPONDENCE .. AT THE THEATREby IAN STEWART • • THE ESTATE MARKETby MICHAEL HANSON .. 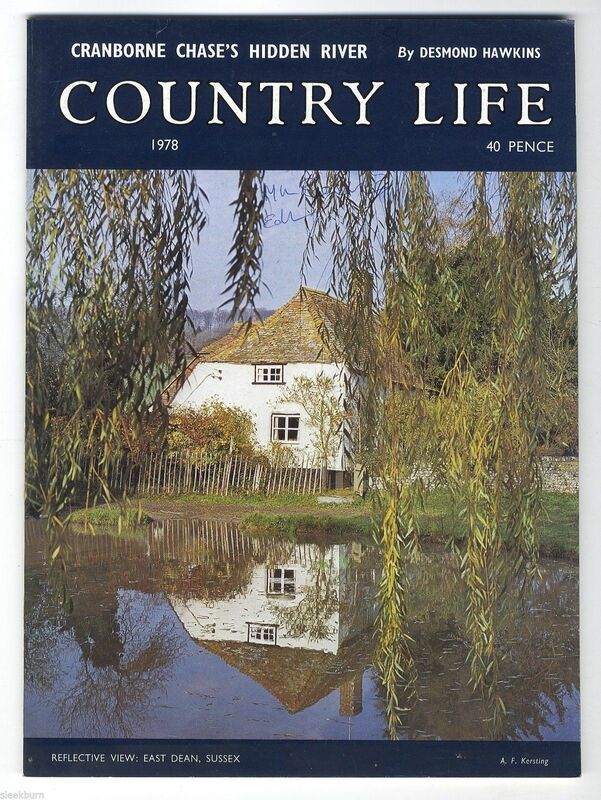 IN MY GARDENby CHRISTOPHER LLOYD THE GARDENING WEEKby TONY VENISON TRAVEL NOTESby KEITH SPENCE CARS DESCRIBEDby JOHN TAYLOR CRICKET IN FOCUSby COI.IN COWDREY BOOK REVIEWSby MARGHANITA LASKI .. . . A COUNTRYWOMAN'S NOTESby EILUNED LEWIS . . A CAUSERIE ON BRIDGEby PAT COTTER .. .. FASHIONby ANNE PRICE.. There is a part address handwritten (in ink)on the front cover picture of East Dean, Sussex. The four digit number in brackets in title is for my ref only. It measures 345 x 235 mm (13.5 x 9.25 " ) approx. It retains the outer advertising cover. The spine is worn. There may be some age yellowing with some spotting. The images are in b&w unless otherwise stated. Some of the pages may have minor cuts tears and blemishes due to their great age. PLEASE NOTE: I cannot guarantee that the issue is complete 'as published' - but what I have described above IS present. As far as I can tell there is a half page advert missing so/but if you are looking for something in particular in this issue PLEASE ASK. If you require information on size of articles (i.e. number of words), sizes of images, please ask before bidding. The process of the page numbering in The Country Life issues are applied in a yearly sequence and therefore do not start at number 1. The descriptive text in my listing details the content in my words and not necessarily what is written on the original page.